We have a friend, a little boy who is almost two who doesn't like to go in the car because he lives in a lovely town where he can go almost everywhere in his stroller. 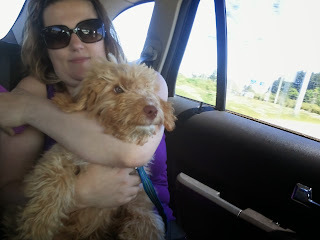 Interestingly enough I have a puppy who hates the car as well. Most likely he feels he can walk everywhere he needs to go. If you want your puppy to love the car make sure you start taking him out in it every day. Even if there isn't a good reason puppy should travel with you until it is second nature. I suggest our mum put puppy in a crate with a dog bone. If the puppy drools or is upset make it short with a treat or a walk at the end whenever you have time. Everything you want puppy to do as a grown up dog it is a good idea to start doing as soon as you can. Myself, I love the truck. I live to go to the dump. This is a picture of an enthusiastic Ruby puppy with his new mum on his first ride home.